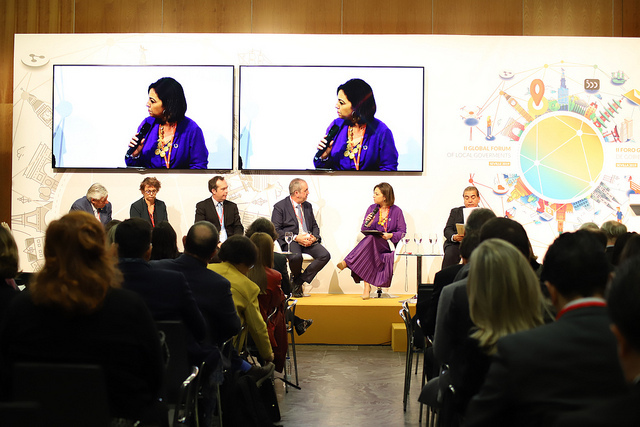 The II World Forum of Local Governments, that took place in Seville from January 24 to 26, is an international meeting that gathers local governments’ representatives from around the World to debate and analyse the challenges that cities face. One of these challenges is the paradigm shift that blurs the boundaries between local, national and global levels, and implies that global actions are also local decisions and actions. This idea could be observed in the debates that took place in these three days, in which the key was to develop joint sustainability action plans as well as criteria for a new model of governance. It was this idea the one that took the official opening –which took place on Thursday 24 January- by storm, showing the role that cities should play in global development. 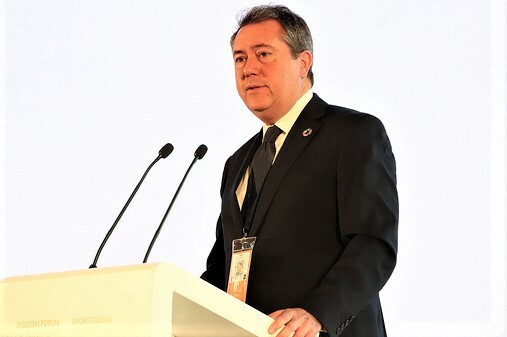 In this opening ceremony, Juan Espadas, Mayor of Seville, reaffirmed the need to reach agreements between local governments and other spheres of government to continue advancing in the implementation of the 17 Sustainable Development Goals, because it is at the local level where the day-to-day realities are seen more closely and where a greater impact can be achieved to improve the lives of all citizens and not leave anyone behind. After the official opening of the Forum, presentations on the 2030 Agenda and Local Governments were held. 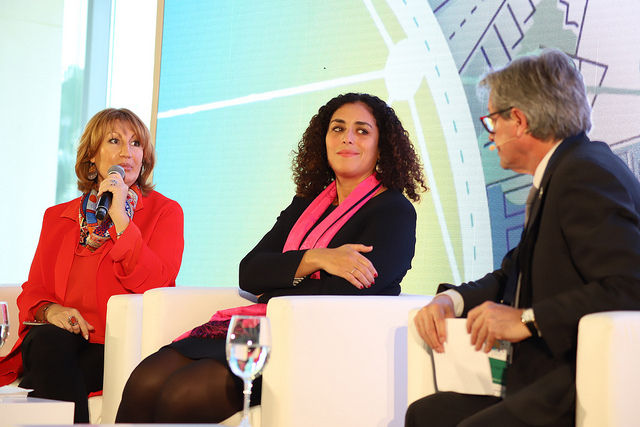 Emilia Saiz, UCLG Secretary General, moderated the session together with Aziza Akhmouch, Head of the Water Governance Programme of the Organisation for Economic Co-operation and Development (OECD). The objective was to discuss how to create more inclusive and sustainable cities that generate opportunities for all through the joint implementation of Global Agendas such as Agenda 2030 or the New Urban Agenda. Emilia Saiz, General Secretary of UCLG, called for solidarity between cities and working together to improve the lives of all citizens with sustainable development strategies based on quality public policies. Meanwhile, Aziza Akhmouch, Head of the Cities, Urban Policies and Sustainable Development Division of the OECD, emphasized the importance of remembering that Agenda 2030 was created with the impulse and commitment of all spheres of government and that all of us should work jointly to meet the Sustainable Development Goals. The official opening ceremony took place at 13:00 where representatives from different spheres of government coincided with other key actors. The Mayor of Seville, Juan Espadas, inaugurated the event, highlighting the role of local governments that work to defend the institutions and make them fairer and more effective, allowing for citizens to see how their problems are solved. Carlos Martínez Mínguez, mayor of Soria and vice-president of UCLG for Europe, stated that "The 2030 Agenda encourages us to make alliances and create complicity with citizens and collaboration between all spheres of government to safeguard public policies and, thus, the sustainable development of cities". Carmen Calvo, the Vice President of the Government of Spain also participated in this event with an intervention where she supported local governments betting on the 2030 Agenda because “small is big, and cities are never small because it is in those spaces where the life of each citizen takes place. Cities must be strong protagonists in global sustainable development decisions". Later, local government representatives from Latin American cities in Mexico, Brazil, Peru, Chile, Honduras, as well as Indonesia and Dubai were able to exchange experiences and different realities in two meetings: one on “Effective and efficient public policies for social inclusion in cities” and the other on “Smart Cities”. The afternoon saw the celebration of the Golden Experience Awards. 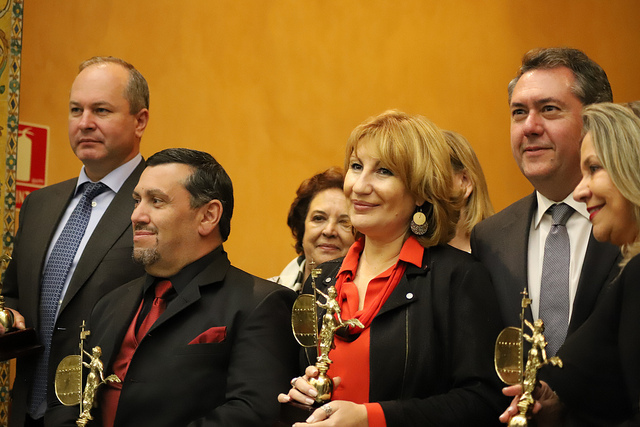 The categories awarded were Smart Cities (City of Cartago), Sustainability (City of Quito), Social Inclusion (Lalalá Foundation) and Sustainable Tourism (City of Rostov-on-Don). The city of Cordoba was awarded for as an example of heritage management and the City of Coral Gables was determined as one of the best cities to live in the United States. United Cities and Local Governments also received an award as an organization for its municipalist struggle promoting solidarity between territories through international cooperation for a more sustainable future at the local and regional levels. The prize was an award with the sculpture of the "Giraldillo", one of the most emblematic symbols of the city of Seville, known as a "colossus” and as an allegory of strength. On Friday 25 January, the table of local government representatives was held in which Cristina Gallach; High Commissioner for Agenda 2030 of the Government of Spain spoke of the importance of "creating alliances between all territories, actors and spheres of government in forums such as this one in order to continue moving forward with the 2030 Agenda together”. After the table, there was an institutional event on the Declaration on the SDGs in which young people and children of different ages pronounced a short speech to the authorities and representatives commitment to asking them to leave a better world for future generations. As the morning progressed, several local elected leaders such as Isabel Ambrosio, Mayor of Cordoba or Eduardo del Pozo, Deputy Mayor of Quito, were able to share different local policies that move forward the sustainability of their cities in the forums on sustainable tour and mobility. In their interventions, they shared how through public services, such as quality urban mobility or caring for local cultural heritage you can make cities more accessible to all. 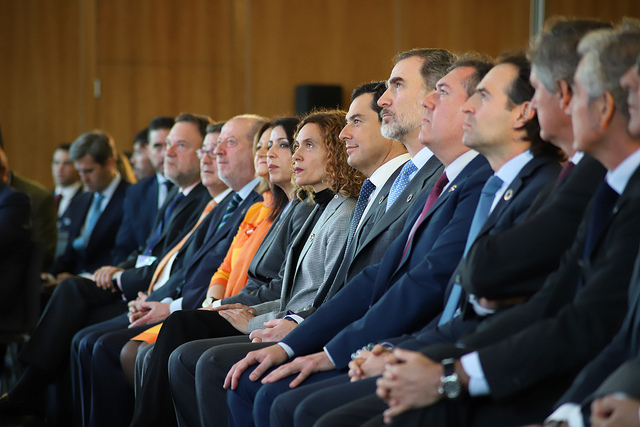 The second day of the Forum ended with a central act in which Federico Gutiérrez, mayor of Medellín, Juan Espadas, mayor of Seville and other representatives of regional authorities, the national government and the Royal Family took part. An agreement was reached to work as a team through a multi-level governance approach committed to implement together the development agendas. The forum ended on Saturday 26 January with the presentation of good practices of municipal companies. Key gatherings such as the celebration of these types of fora enhance the voices of local governments and drive concrete local actions for global transformation. It is in cities, the administration closest to the citizens, where the most basic requisites for life take place: coexistence, cohesion, equality and solidarity. Visit our gallery of photos on Flickr. Video II Global Forum of Local Governments.